In less than a year since we announced our first biocompatible 3D printing resin, dental practitioners worldwide have successfully completed more than 10,000 guided surgeries using Dental SG, resulting in better clinical outcomes, faster surgeries, and an improved patient experience. Today, we’re excited to announce a new partnership with 3Shape, the global leader in 3D scanning and CAD/CAM software for dental practices and labs, to introduce software integration solutions that bring seamless dental 3D printing workflows to the worldwide market. 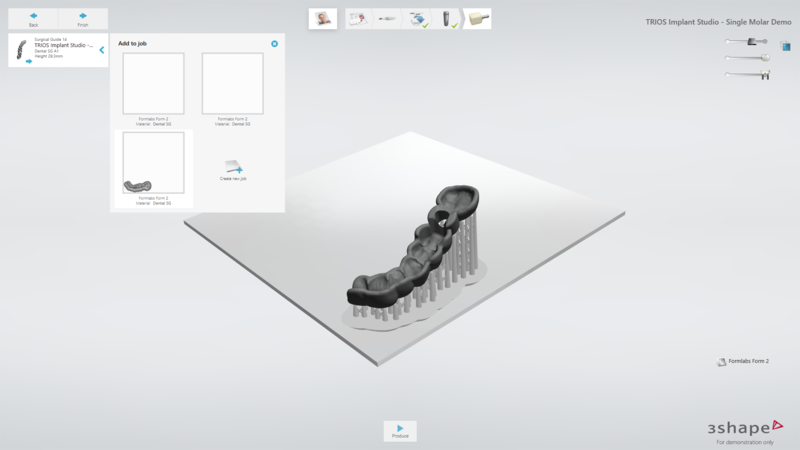 Formlabs and 3Shape now offer the first complete digital solution for dental professionals. The new dental 3D printing workflow streamlines the surgical guide design and manufacturing workflow, making it easier and more affordable than ever to produce surgical guides. With the Formlabs-3Shape integration, dental practitioners can create guides ready for surgery by scanning with 3Shape TRIOS intraoral scanners, and completing design in 3Shape Implant Studio software. Print setup is then as simple as clicking &ldquo;Print&rdquo; in Formlabs’ PreForm software, after which guides are manufactured within a matter of hours with Formlabs’ biocompatible Dental SG resin. While printing surgical guides used to take weeks, the Formlabs-3Shape integration creates a cost-effective chairside 3D printing workflow that makes even same-day guided surgery possible. Formlabs' Dental SG resin is available now, and the 3Shape Implant Studio integration is launching later this year as a software update. Surgical guide design in 3Shape Implant Studio. Integrated Form 2 3D print setup in 3Shape Implant Studio. “We now have surgeons designing and printing their own surgical guides in hours using integrated 3D printers like Formlabs’ instead of waiting weeks, and at a fraction of the cost. Because of the huge time and cost savings, doctors are now using guides on every surgery when clinically applicable. This has translated into faster and more predictable treatments for their patients,” said Birk Ploennigs, Product Director of Implantology at 3Shape. 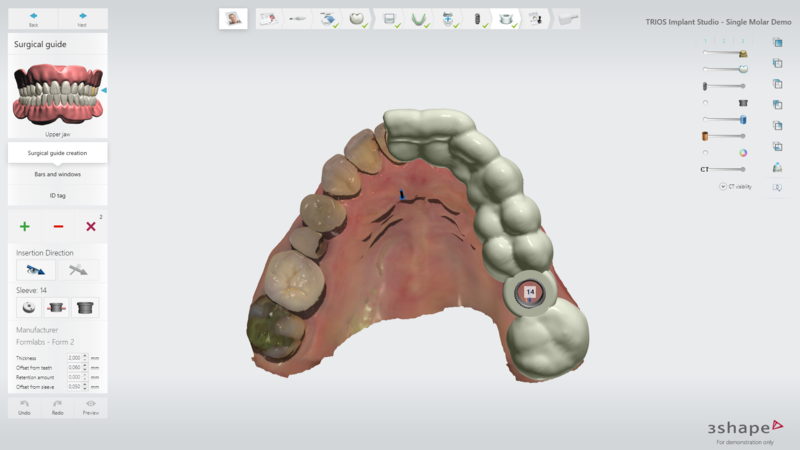 Further integrations across 3Shape’s suite of powerful dental software, including Dental System and Orthodontic System, are under development and planned for release throughout the year. These will enable a wide range of workflows that include restorative models, nightguards and splints, and 3D printed dentures. Request a Dental SG sample part, schedule a call with a one of our Product Specialists or see live demos of Formlabs’ new dental materials and integrated workflow with 3Shape at IDS 2017 (Koelnmesse, Germany, March 21-26): Hall 3.1, stand L70. Workshops are available daily at 10:30 am and 2:30 pm CET.